If your school is visiting Hanmer, let us provide an activity for you! Choose from archery or mountain biking. We can tailor a programme to suit your group. Contact us for specialized, informed advice. We can even help you arrange suitable accommodation. An ancient sport that will try your skill and eye! Who can shoot closest to the bullseye? 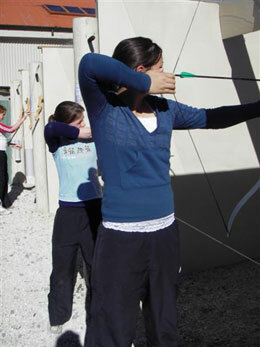 Children are intrigued by the bow and arrow and love to compete with one another to score the most points. 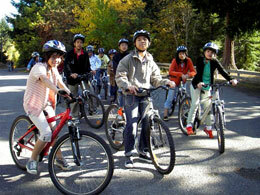 School groups are a speciality of Hanmer Springs Adventure Centre. Balloon target shooting – pop all the balloons! We are New Zealand’s largest mountain bike adventure company, with over 10 years’ experience in providing guided adventure programmes to schools. Our 2 hour guided mountain bike package takes school age children through the Hanmer Forest, exploring the tracks with opportunities to see native and exotic flora and birdlife while enjoying the “great outdoors”. Great for confidence building, this activity is fully guided. Children are fitted with approved cycle helmets and mountain bikes to suit their size. A full briefing is given covering bike and road safety. There are opportunities for short breaks during the ride. Accompanying adults are provided with free bikes (one per ten paying students). Want to enquire about this service? Please contact us for further information and advice.